Market Lavington and Easterton Hospital Weeks took place in August. For many folks it was a chance to escape from what really was a daily grind. Folks could let their hair down and enjoy the events, many of which were by local people for local people. The villages of Market Lavington and Easterton always came together for Hospital Week. Today we are looking at a poster for one such week. We have a number of posters like this at the museum. In today’s paper sizes they’d be something a bit larger than A2 size. Many are on coloured paper, but this one is on white. They all have the disadvantage of not having the year in question on the poster. 1930 had a Sunday 10th August so it could have been that year. The previous year with a Sunday August 10th was 1924 and that predates the BBC. 1936 would be another possible year. The only other clue we have is that our near neighbour, the Warminster Dewey Museum, have a photo of the Les Whitmarsh band dated to the 1920s. Other names on the poster give little clue as to the date. Miss Bouverie, Mr Benson, J H Merritt, Mr Pike, Mr Drury and Mr Welch were all long term local residents. But we do get an idea of what went on, opening with the band concert at The Old House and a sacred concert at the Parish Hall. This was followed by a whist drive and then the cinema in the Parish Hall. 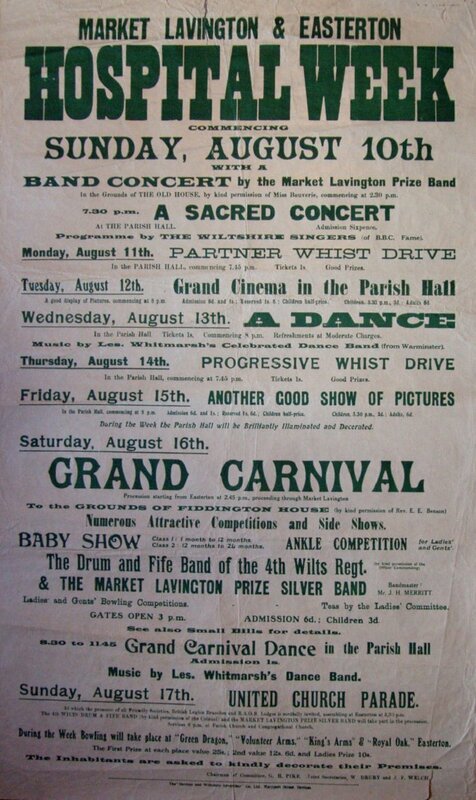 The Carnival Dance, with Les Whitmarsh was on the Wednesday and on the following days there was another whist drive and another film show. The Grand Carnival was on the Saturday with the procession starting in Easterton, processing through the villages before ending up at Fiddington House where the grounds were used for a fete. Attractions included the baby shows and the ankle competition. Two different bands performed. In the evening, Les Whitmarsh was back for another dance night. The week ended with a United Church Parade on the final Sunday. And if this excitement was not enough, then you could decorate your house or compete in skittles at The Green Dragon, The Royal Oak, The Kings Arms or The Volunteer Arms. This entry was posted on September 10, 2012 at 5:11 am and is filed under Museum. You can follow any responses to this entry through the RSS 2.0 feed. You can leave a response, or trackback from your own site.